Sometimes I feel like I'm really missing out on something. The whole world, it seems, is full of people dreaming lush complicated, strange, and insightful dreams every night, but most nights when I finally sink into my pillows, it's like the light switch is flipped and no one bothers to come back and switch it back on until the alarm jars me awake in the morning. Every once in a while, on those rare mornings when I can sleep in a little, I'll wake up with the vague feeling of having interrupted someone who was telling me a story. A complicated one, with many plot twists. And I'll wake up wanting to stay in bed, if only to find out how things ended, but finding the threads of the dream unwinding and disappearing even as I desperately clutch at them, trying to weave them back. I'll pretend that I never woke up, lying to myself and hoping that if I can really fool my brain, the story reel will sputter back to life and play till the end. It never works, and by the time I've washed my face and brushed my teeth, I can't even remember what I was dreaming about in the first place. It's strange, but it's only when I'm sick (or sleeping off a night of drinking, to be completely honest) that I end up remembering my dreams. Probably because I don't sleep as deeply when plagued with coughing fits or when my head is throbbing. But if I do remember them, I remember them forever. There are a few regulars that replay in my head like a worn movie, with only minor variations, like puzzles that I try to solve in different ways, but without seeing the big picture, the great plan, I always get the same results. There is the occasional "why didn't I put on my pants before I left the house this morning?" dream that everyone gets. But once every few years I'll get a completely new dream. One that is strange and disturbs me on a whole new, previously unimaginable, level. And then I'm thankful for missing out in the first place. 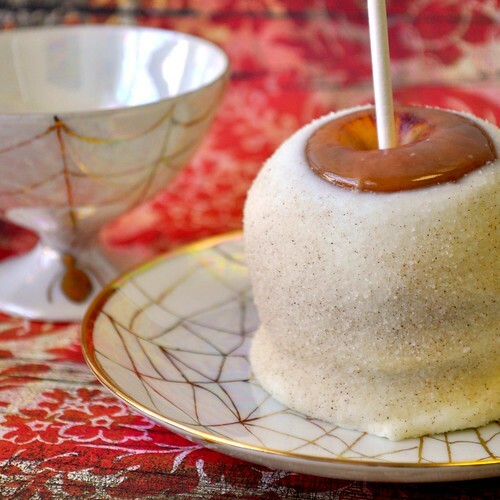 I ran across this post over at How Does She, and white chocolate and caramel enrobed apples sprinkled with cinnamon sugar looked so beautiful and sounded so dreamy that I had to give them a try. Plus, I got to pose them with one of my favorite tea cups. It's pearly white and delicate, with golden spider webs and spiders that manage to look elegant and not creepy. In the middle of the saucer is a spider who just finished spinning the name Hazel into the center. While I don't know who she was, I can dream up quite a character for what she might have been like, and I think she and I would have gotten along quite nicely. I didn't really follow the recipe on that site, just used the idea, and the apples came out great. I'm still looking for that perfect caramel recipe though, so until I'm happy, I'll just tell you to head over there and give her recipe a try. It looks and tastes just like an apple pie. Yummy. I love your writing style! And these apples look fantastic. BTW...you made me incredibly envious of your sleeping routine!!! I've been looking for this recipe forever after trying a similar apple sample at rocky mountain chocolates. The sales woman said it tasted like apple pie and she was right!! Before this the only apples I eat are red and candied, not a fan of caramel or white chocolate but I tried it anyway and LOVED it. It's sad that they're so expensive though. Fabulous shots, going to try this. Thanks! Love the tea set btw! Umm, YUM! 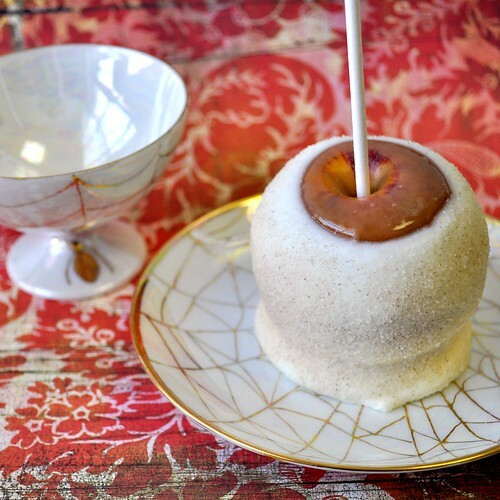 I had a caramel apple for dinner last night ;) This looks AMAZING! I can't wait to try it! OMG! These look to die for!!!! They were so good. I wish everybody didn't bring them home. On another note, that apple looks DELICIOUS! And pretty too. These are absolutely gorgeous! And those dishes are way cool. Do you have brand on those.... i love them! Your photos turned out beautifully!